Considering the fact that Aberdeen and Inverurie Locos didn't play a match against each other until March 1931, the two Clubs have has what might be called a life-long relationship. Formed within months of each other, the senior team always kept an eye on developing talent at Harlaw Park and two of the best-known signings from there were Cody Mutch and Norman Davidson, players who had a substantial impact at Pittodrie. This and much more can be gleaned from the pages of David Fasken's lovingly compiled book. You don't even have to be a football fan to find interest in the pages. Railway buffs can fine excellent details of the historic development of the Loco Works itself and the impact it had on the Donside community and the railway colony that grew up there. The greater part of this 400+ page book is of course taken up with accounting for the years of progress by the Locos and the players, managers and other characters who have come and gone over the space of 113 years and counting. The detail is comprehensive and impressive piece of work that has taken its author three years and countless hours of effort to research and compile. Any football fan who enjoys the minutiae of the beautiful game will find the effort worthwhile and the price of £20 a good investment in the A4 sized book. Perhaps the most famous football personality in all of the Locos' history was Andy Beattie. Best remembered as a long-serving player with Preston North End, and for being the manager of Huddersfield Town who signed Denis Law, as well as the first proper Scotland International manager. Beattie too has a link to Pittodrie where he played as a wartime guest on eight occasions in competition and once in a friendly match against Newcastle United. Most people believe that Inverurie Locomotive Works FC and Aberdeen FC were formed in the same year, the badges certainly say so, but in fact the book reveals that this is not the case. Even though the official date of foundation is 1903 David Fasken's research has turned up documented evidence, including photographic, that the Locos started to get up steam with their first matches in 1902. Nobody knows where 1903 came in and it will probably remain a mystery, but maybe the Club just wanted to stay on parallel lines with the big city friends in Aberdeen. 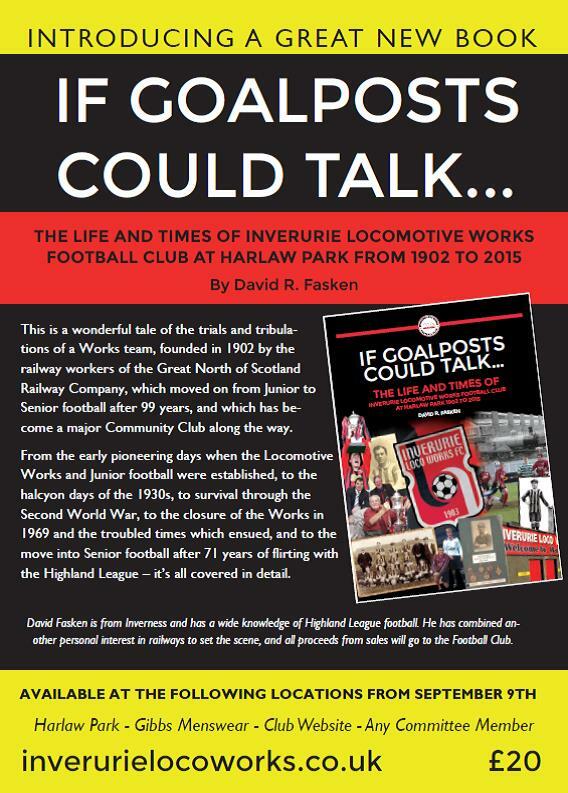 You can pick up a copy of this excellent new book in person from Inverurie Locos for £20 or by post for £24 via inverurielocoworksfc@highlandleague.com - [overseas postage will cost a bit more - it is heavy] - please check at http://www.inverurielocoworks.co.uk. All proceeds will go direct to Inverurie Locos' funds. Just tell them Aiberdeen sent ye.